Bad weather, poor planning, a lack of safety equipment. Any one could put a boater in the kind of peril that befell two NFL players and their two friends off the coast of Florida last weekend, Coast Guard officials say. And such incidents happen all too often. The capsizing of the 21-foot fishing boat carrying the four men to a favorite fishing spot in the Gulf of Mexico was the latest of 200 such incidents reported to the U.S. Coast Guard in the past five months. “The oceans are an unforgiving environment,” said Coast Guard Lt. Cmdr. Chris O’Neil. “Weather can be unpredictable. Any time you are in an open environment, you are taking a certain amount of risk.” That risk includes being lost at sea like Victor “Marquis” Cooper, an Oakland Raiders linebacker; Corey Smith, a Detroit Lions free-agent defensive end; and their friend William Bleakly. The fourth member of the group, Nick Schuyler, a former University of South Florida football player, was found around noon Monday clinging to the upturned boat in rough seas about 35 miles west of Clearwater, Florida. The four men had left for a fishing trip from Seminole Boat Ramp in Clearwater Pass on Saturday. The U.S. Coast Guard is unable to provide specific numbers of how many people go missing from boating accidents like this past weekend’s, but officials say that since last fall there have been three people who have not been found after triggering Coast Guard searches. Those incidents can range from an unaccounted swimmer to a passenger gone missing after a boat sinks, said O’Neil, at the Coast Guard headquarters in Washington D.C. Capsizing is one of the leading boating accidents, according to the Coast Guard’s most recent report on recreational boating in 2007. Officials report there were 398 accidents from capsizing, causing 204 deaths and 284 injuries in 2007. Capsized boats cost nearly $1.8 million a year in property damages, officials say. Collision with vessels or fixed objects and falling overboard are other major boating accidents. Last weekend, Florida state officials recovered the bodies of a 48-year-old man and his 7-year-old granddaughter after their 15-foot bass tipped over in Lake Okeechobee, according to CNN affiliate WPTV-TV in West Palm Beach, Florida. “The steering cable broke and the boat went out of control,” family member Isabelo Santiago Jr. told WPTV. To remain safe on any body of water, Coast Guard officials stress having the proper safety equipment and being wary of changes in the weather. The NFL players’ boat capsized off Florida in waves up to 10 feet high while being buffeted by winds up to 45 miles per hour, Coast Guard officials said. They reported 110 cases since this fall where a boat has been beset by weather. Boaters should wear a life jacket at all times, officials say, because an accident can occur so quickly that passengers may not have time to put their life jackets on. A life jacket that is bright or has deflecting tape to help catch the eyes of rescuers is recommended. Boaters should also keep a bag with flotation and communication devices, officials said. The Coast Guard encourages boaters to purchase Emergency Position Indicating Radiobeacons (EPIRBs) that can cost between $200 to $1,500. This technology enables emergency signals to be sent out automatically or manually when a boat sinks. Some EPIRBs have global positioning devices that can help provide the rescuers with a more exact location. 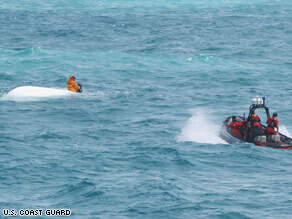 After a boat capsizes, passengers should always stay near the vessel to make it easier for rescuers to find them, especially in waves and high winds. Whitecaps on waves can also confuse Coast Guard searches. Schuyler, who was rescued on Monday, was easier to find because he was near the boat, Coast Guard officials say. Wayne Cathel says he and six of his friends were in a similar situation in 1993 when their boat capsized during a spear fishing trip in John’s Pass in South Florida, according to CNN affiliate Bay News 9 in St. Petersburg. The group was stranded for 18 hours before being rescued by a helicopter. “We all had to cling on to the hull of the boat for the whole time until we were finally rescued,” Cathel said. “You never leave the largest object in the water,” he said. “I mean that’s what you stick with.” Sticking with the overturned vessel also helps the Coast Guard use advanced computer technology to find it, officials said. Called SAROPS, or Search and Rescue Optimal Planning Systems, the program takes into account external conditions such as weather, ocean patterns and information available about the case such as which dock the boaters departed from to map locations in the ocean where officers can search. The program, which has been used by the Coast Guard’s Seventh District for nearly two years, helps officers narrow down the location, especially critical during the beginning of a search, said Petty Officer Jennifer Johnson of the Seventh District.